We awoke to Guillaume’s roof echoing the sound of the water droplets of our morning shower. There is perversely something vaguely cosy about the sound of rain on a caravan’s roof. After stirring ourselves into lethargic action, our morning shower was followed by the very similar sound of our coffee shower. After another brief pause, our coffee shower was replaced by the sound of our breakfast shower. We scanned the four points of the compass as far as our position allows. Little but solid grey greeted our gaze. It was going to be one of those days. While Francine tried to rig Guillaume as a drying room for her laundry which had failed to dry yesterday, I went to Villasavary for a paper, mainly for the forecast, and bread. I got the last Aujourd’hui paper but, as the rain began again, discovered that Tuesday was the day for Villasavary’s boulanger to be closed. Definitely one of those days. I forced myself to call in to our local boulanger at Fanjeaux to buy une baguette from one of the seven dwarves [private joke: she’s very grumpy]. When the Jet Stream messes up the European weather, it really does it in style. Basically, most of France looks v. unsettled for the next four days, save for an eventual ray of hope around the Mediterranean. The French forecasters in Aujourd’hui do, at least, have fun with their words; for June 21st (the first day of summer), their caption reads, “Vous avez dit été?” [Did you say summer?]. There was little point sticking around a campsite, the highlights of which were likely to be very grey moments when it wasn’t actually raining, so we packed lunch, including Grumpy’s baguette, and drove east towards the Minervois. The rain relented and eventually small breaks in the cloud appeared allowing Apollo to peek through weakly. We tried what looked like a promising site beside a lake for a pique-nique but apparently we were the only ones who’d had that thought; the area smelt faintly like une toilette and there was but a single concrete table complete with centre well filled with rain water and infested by ants – large ants. We left. We had much better luck at Argens-Minervois. 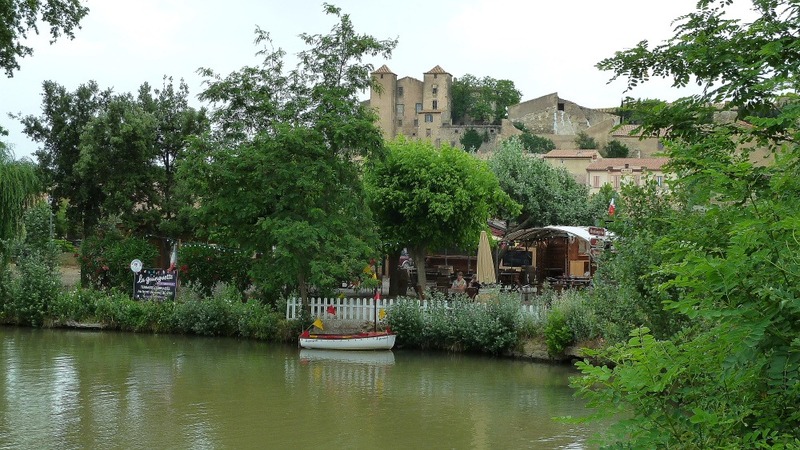 Here was a pleasing village/small town beside the Canal du Midi. Immediately opposite our parking spot and directement sur les bords du canal [directly on the banks of the canal] was an enticing little restaurant called “la guinguette” [literally, a cafe with music and dancing – mercifully not at lunch time] with a shaded terrace and – and this is the clincher – specializing in cuisses de grenouille flambée au pastis [frogs’ legs flamed in pastis]. Sold! Grumpy’s baguette remained firmly locked in the car, as did the filling intended for Grumpy’s baguette. Now, it must be said that Francine is, on occasion, a game old stick. However, in the same way that her gameness fails to extend as far as andouillettes [chitterling sausages] and anguilles [eels], neither does it extend to cuisses de grenouille (left). I think it’s the shape of the legs that put her off – they look like a pair of crossed arms trying to give you a cuddle. 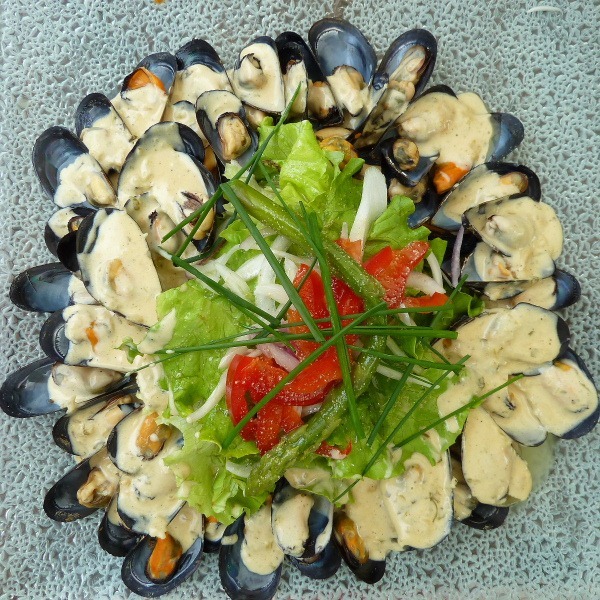 However, a plateful of mussels (right), this time referred to as mouclade because of the method of preparation, did appeal. We ordered, together with a small bottle (50cl) of Corbières blanc to wash everything down. Very pleasant. Afterwards, we even found a few Odos flitting about the canal and a marina nearby, though they didn’t think much to the overcast weather, either. Having returned to Guillaume, where the laundry was still not properly dry, my evening shower was greeted by another shower and my writing of this posting was greeted by a rather lengthier shower. Rats! 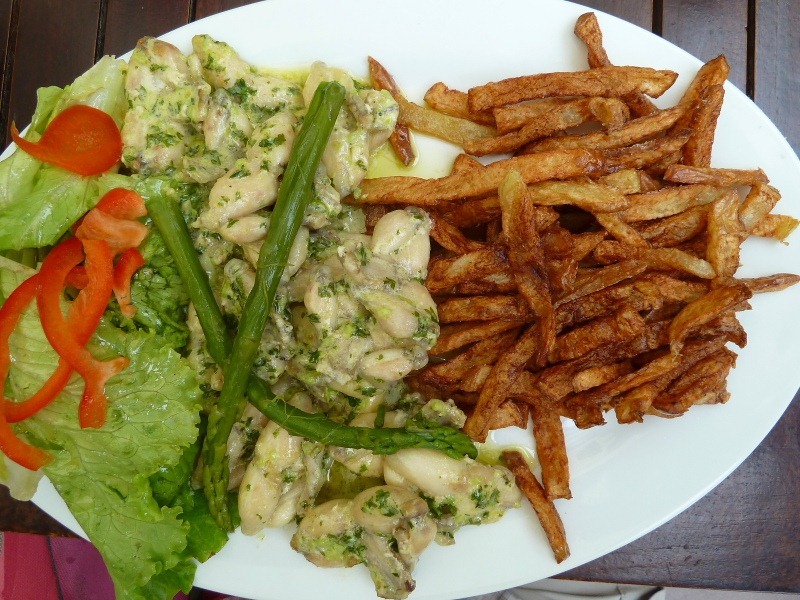 Footnote: [that’s a joke, BTW – frogs’ legs, footnote] whilst the restaurant may claim to specialize in frogs’ legs, it could certainly use a lesson in the cooking of chips/frîtes/French fries. Those sad, limp, soggy, flaccid, brown items in the photo nestling beside my perfectly fine cuisses de grenouille were, without doubt, the very worst chips/frîtes/French fries I have ever experienced. Quelle domage!